Gregory Van Maanen has been reborn many times in this lifetime. Each time presented itself as a transition into another kind of life. Each time pushed him into his unique art more deeply. The first and most significant rebirth was his war experience in Vietnam in which he was seriously wounded. Essentially, he rose above the tragic and bloody tunnels and battlefield. In his own words he was sent back to earth, having been told by a Voice that it was not his time yet, and to continue with his life. He was still a teenager. This near death experience became his muse. He arrived back in the United States, became a pacifist, and began making art. He took advantage of the free GI Bill program, which landed him in Mexico for a while. Through his art-making he struggled to avoid the terrible post-war traumas so many of his fellow vets were going through. His work became a journal of his forgiveness of war’s demonic violence and energies. War takes one beneath the veneer of civilizations’ shallow politesse. Van Maanen was opened to universal worlds of spirits, raw emotions and the harsh realities of the Natural world. He moved to Paterson, New Jersey where he lived hermetically, filling his studio with hundreds of fierce and beautiful sculptures and paintings. His studio became a cave in the concrete jungle. 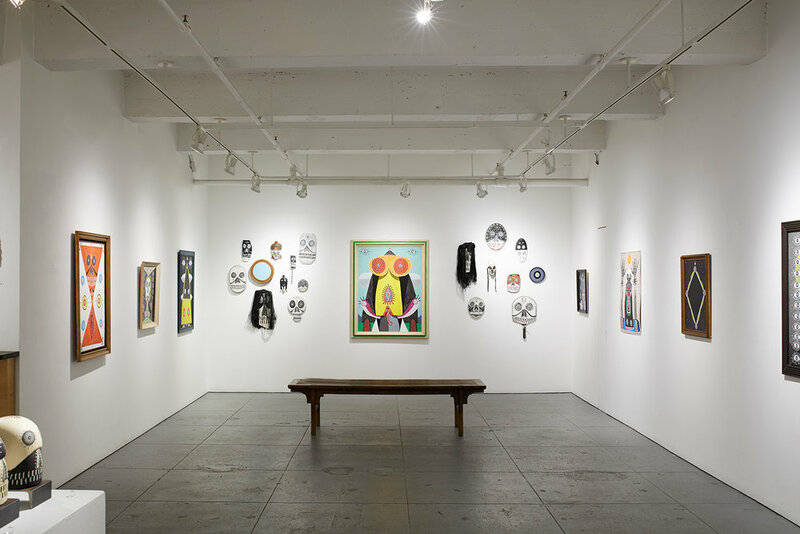 In the mid-1980’s Cavin-Morris Gallery began to represent Gregory Van Maanen. For us he broke the existing canon of what was then known as 20th Century Folk Art. He was no folk artist nor was he part of the art world’s mainstream. His work took us further into the idea of Art Brut, and the use of art as a pure unfettered vehicle of transcendence. It was feral. In 2007 Kohler Foundation purchased his entire studio as an urban indoor environmental site. The studio was then gifted to John Michael Kohler Arts Center, in Sheboygan, WI, which is known for its focus on artist-built environments. Van Maanen moved to Rochester with his partner, June Avignone, and tried to get his bearings in an entirely new physical situation and community. The basement of his house became his new studio. After a year or so it began to feel like his cave again and he continued to freely push those visions forward. This exhibition, the first since his move to Rochester, is yet another rebirth. His paintings pursue an alternative plane of existence. He is an artist for whom everything has meaning and portent, a true animist. With his art he holds the darker side at bay, and feeds his amuletic stories to the process of light and life. The variety of imagery he is able to invoke in his tight personal vocabulary speak to every world culture. For further information info@cavinmorris.com or call 212-226-3768.